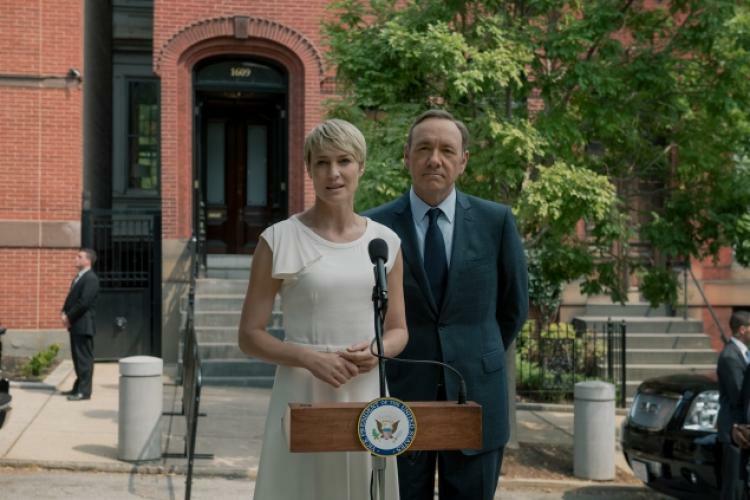 The Underwood's home in "House of Cards" is up for auction with a starting bid of $500,000. 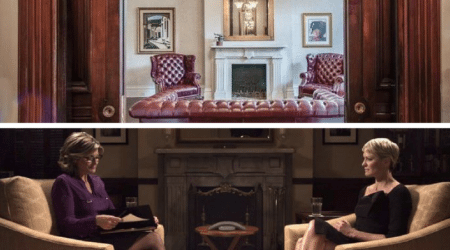 When we’re first introduced to Kevin Spacey’s Frank Underwood in House of Cards, we’re led into an unforgettably gorgeous, dimly-lit home — the beautiful backdrop for many of the plans and schemes that finally got him to The White House. Now, after watching for five seasons, buyers have the chance to own that piece of television history. Frank and Claire during a press conference in front of their home. The famous home will be up for auction on July 27 with Alex Cooper Auctioneers with a deposit of $25,000 and a starting bid of $500,000. Although most viewers assume the home is in Washington D.C., it’s located in the Bolton Hill neighborhood of Baltimore, Maryland — where most of the street and neighborhood scenes in the series were filmed. While the gorgeous red brick and forest green trim of the Victorian-style home will be familiar to the lucky owner, the inside will be quite a bit different than what was seen on screen. The interior shots were filmed on set in a warehouse located not too far from the home’s Park Avenue location. The set designers did take some features from the home, such as the foyer and sitting room, and recreate them almost exactly. Other parts of the home, such as the kitchen, will be totally different than what was shown on the show; but every bit of the home is just as gorgeous as Frank and Claire’s chic and sleek Washington D.C. abode. The 4,600-square-foot home has five fireplaces, a living room, family room, dining room, butler’s pantry, utility room, sitting room, an anteroom (also known as a waiting room), two large bedrooms and a full bathroom with a jetted tub and walk-in shower. Auction Agent Jared Block says the sellers have an undisclosed reserve, but they expect the home to sell well above the starting bid price. “I can’t disclose the reserve, but what I can tell you is there’s a house across the street that just went under contract and it was listed for $749,000, and I believe that our house is superior; so, that should give you some kind of idea [of what the house will sell for],” he said during a phone interview. 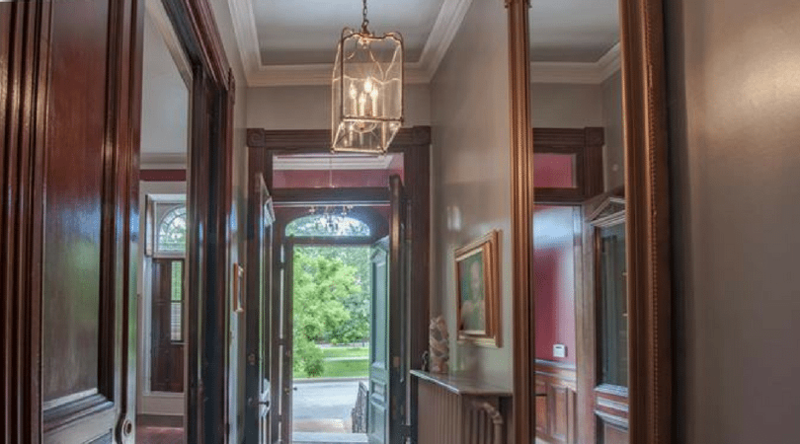 Block says the home’s original 1883 features and fixtures have been a strong selling point, but he expects the home’s “House of Cards” fame will play a part in the final bidding price. “To my surprise, most people [who have privately toured the home] are familiar with that house and the fact that it was in the show,” he says. Block says the home’s notoriety has also garnered attention from media outlets such as “The Today Show,” Elle Decor and Architectural Digest, which he also expects to have some positive impact on the auction. Other Realtors and auction experts have chimed in on the sale, and some predict the five-year emotional connection that some buyers have to the home will certainly have an influence when it’s time to bid. “An auction lends itself to generating a higher price point than a traditional selling situation would because buyers bid up the price in a competitive and emotionally charged environment set up for such escalation,” said Metropolitan State University of Denver’s College of Business Senior Lecturer Darrin Duber-Smith in an interview with realtor.com. Considering the popularity of House of Cards, it will be very interesting to see what the winning bid is.